If you have followed my blog since last year then you will know that my birthday was a disaster! If you’re new you can read about that mess here. So maybe, I was insane to agree to travel on my birthday again. But thankfully this year completely redeemed my faith in birthday adventures. After a faultless flight with Virgin Atlantic which you can read about here. I was picked up by a transfer, booked through Royal Caribbean, which was quite possibly the biggest car I have ever seen. It was truly American in style! We were dropped off at the Courtyard by Marriott Lake Buena Vista; a newly refurbished Disney partner hotel. Check in was smooth and in contrast to being homeless last year, this year Royal Caribbean had accidentally booked us three hotel rooms…They didn’t charge us for all three though so it wasn’t a big deal. We wandered down miles of corridor that would prepare us for trekking from forward to aft of the mammoth Oasis of the Sea’s in a few days time. Now as a family we didn’t really rate this outlet…It is pretty small and wasn’t much cheaper than outlets in the UK. Although we would recommend Orlando Premium Outlets on International Drive. But more about that coming up real soon. I’m not sure if everyone has this problem or if its just that I travel too much. But in most countries I have favorite foods and clothing brands that are unavailable to me in the UK. This morning we set off in pursuit of these things and also in pursuit of IHOP because I wanted to try it. Firstly though, we swung by reception, we needed to get a safe (a weird quirk of this hotel is that there is actually none in the rooms) and book our shuttle tickets to Disney, the Courtyard by Marriott Lake Beuna Vista, offers a free shuttle to the parks. But it does require a ticket and only comes at set times. While we were at reception we also purchased IRide trolley tickets. A single fair is $2 but a day pass is $5, so if you are planning on hoping on more than once the day pass is well worth it. To catch the IRide trolley you have to walk down to the Vineland Outlet – Here you can hop on and go for miles! We rode to IHOP were I started my day with the pancakes of dreams! Thick and fluffy adorned with icing, cream and sprinkles; I wish I could eat them for breakfast daily. Luckily for us next door to IHOP was Walgreens were we could grab all our favorite American snacks. For me personally, I’m a sucker for junior mints and goldfish crackers. Although a lot of American foods have made there way across the Atlantic you never see my favorites in the UK. So picking them up is a must for me when I’m in the states. After that we got back on the IRide trolley to the Orlando Premium Outlets International Drive. This complex is much bigger than the one at Vineland and we had much more luck finding bargains we loved. Although they had the funniest idea of customer service I have ever seen. Not funny as in they were bad, funny as in it was genuinely hilarious and kept me laughing for the entire day. Outlet shopping over and we were Disney bound! Repeating the IRide trolley journey with the kindest driver who not only helped someone locate their stop but also stopped the trolley to direct them when they got off and walked in the wrong direction. Purchases dropped off at the hotel we jumped in a taxi to the parks having missed all the morning shuttles. If you are thinking of staying here a taxi to the Disney transportation center will cost you about $15. From the transportation center we rode the ferry into the Magic Kingdom. I loved the ferry system and was amazed by how many Mickey fans fitted onto one boat. We arrived in the middle of the Festival of Fantasy something which was firmly on my to do list for the next day. The afternoon was spent going on all of my favorite rides in and around Fantasyland and eating glorious Mickey shaped ice cream sandwiches. As amazing as the rides are; as intricate as their themeing was it was not them that made me believe in Disney magic. Disney magic belongs entirely to Happily Ever After! Disney has had a number of firework displays over the years but this is truly the most spectacular thing I have ever seen. Together an amassed collection of adults and children, everyone from 2 to 102, stared expectantly at a castle. The ultimate symbol of Walt Disney’s vision. They watched projections artfully timed to fireworks and music and together they felt. Among that crowd there were tears, laughter, singing and dancing. As we all made memories that would last a lifetime. It was so magical that it felt like a personal birthday gift to me. It may have been April 27th in the USA but in the UK were I was born it was already April 28th. My birthday was starting with more Disney magic than I could ever dream off. And as the mass exodus towards the park gates began; I looked around and thought we must always remember that it all started with a mouse. Since, it was already my birthday in the UK the day ended with presents my Mum had smuggled secretly from the UK. I ended the day grinning from ear to ear. Technically I was another year older but you know what they say: Old enough to know better and too young to care. We weren’t booked on the bus to Disney till about 11am so there was plenty of time for a lazy morning. Before we wandered across the hotel complex and through the car-park to the Golden Corral. Now you hear a lot of bloggers and vloggers talk about the Golden Corral. I now understand why its talked about so much because it was hands down one of the strangest experiences of my life. The Golden Corral is a buffet so you pay as you go in, normal right? Well that is were the normal ends…I was thinking innocently that it would all be breakfast foods but that was definitely not the case. Traditional breakfast foods were punctuated by foods such as: pizza, mac n’ cheese, chili, a joint of beef, a chocolate fountain and an ice-cream machine…Not denying that the breakfast foods were nice but seriously who eats mac n’ cheese for breakfast. With full stomach’s we spent some time exploring the hotel. The Courtyard by Marriott sits in a complex with two other Marriott hotels. The complex has a fountain at its center and all looks newly renovated and pristine clean. There is a shiny park for young travelers, shaped like a rocket with a sponge floor to spare any injuries. A strip of artificial grass holds games such as connect four, there is a gift shop and movies are aired outside via a projector. If you are wanting to go to Disney but don’t have the budget to stay on property; this is a great little alternative. I mean just look at this beautiful pool where I replied to all my birthday messages. My birthday was spent in Magic Kingdom, were many a Cast Member wished me a Happy Birthday thanks to the birthday button displayed on my dungarees. My favorite ride of the day was hands down Pirates of the Caribbean; which also had the worlds longest queue. But Oh My God I don’t remember it being that spectacular, there was a full ship replica in there. 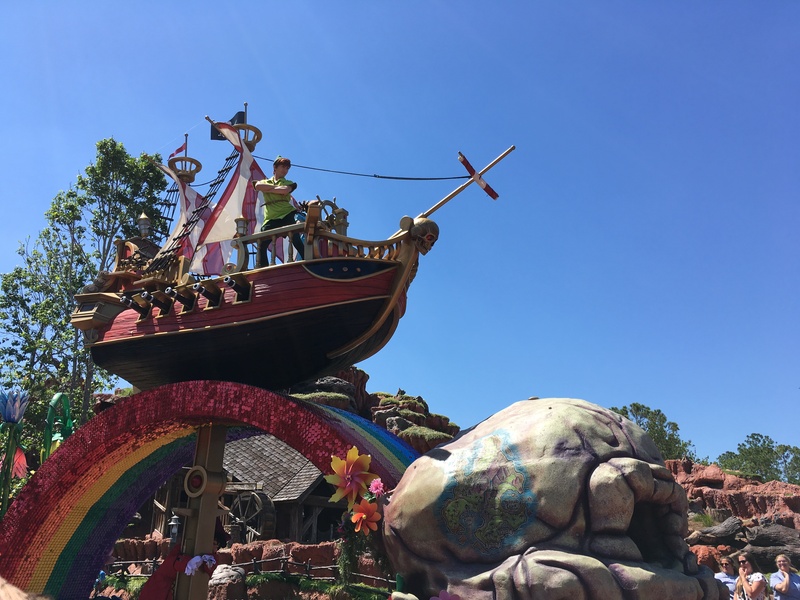 The next hi-light of my day was the Festival of Fantasy – I have always been a parade kind of a girl as opposed to a roller-coaster kind of girl. Probably because I was in a Disney parade as a kid were I was a chimney sweep alongside Mary Poppins. Of course, more rides followed and a giant sugar cookie because when in Disney you have to embrace all Mickey shaped foods, right? Perhaps the most amusing part of this day was that on the way to Disney springs a bus wished me Happy Birthday. A bus! Now that is definitely a form of Disney magic. Disney springs was also great for feeding my Alex and Ani addiction, yet another thing I love that you don’t really get in the UK. But aside from that I didn’t really rate Disney springs; I expected it to be like Downtown Disney in Paris. But it was so commercialized that it was virtually a shopping mall. So we grabbed a taxi out of there and went for some food near the hotel. My birthday was almost over and our time with the magic of Mickey was definitely over. But the next day would bring a fresh wave of magic and excitement; as we started the second leg of our adventure and boarded a ship to sail around the Caribbean.